Lamb Brand is happy to launch the new designed bottles for the Herbs, Spices, Seasoning and Peppers. All these are vital ingredients in many dishes and add flavour, aroma, colour, texture and even nutrients. Herbs, Spices, Seasoning and Peppers were used long ago and are common in most foods around the world today. Each section is kept colour coded so one can easily identify the difference between the four. Green for Herbs, orange for Spices, purple for Seasonings and black for Peppers. Lamb Brand Herbs come from the leafy and green part of the plant. There are numerous different herbs, each one having its own unique aroma and taste. Herbs can be found in many places around the world and are probably the best gifts of nature. Lamb Brand Spices are parts of the plants other than the leafy bit, they are obtained from seeds, fruits, roots, barks, bulbs or stems. Spices are not necessarily as fresh as some herbs can be, but they are usually stronger smelling and quite often stronger tasting. 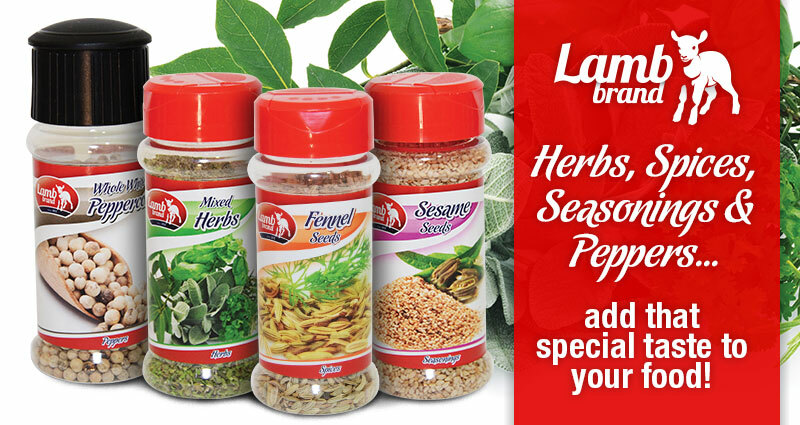 Lamb Brand Seasonings are a blend of natural herbs and spices that give your favourite dish a twist. These special selected mixes will surely improve the flavour of your food. Lamb Brand Peppers, pepper is one of the world’s most popular spices, since a pinch is added to almost every type of recipe imaginable. Pepper comes from the pepper plant, a smooth woody vine that grows in hot and humid tropical climates. They begin to bear small white clustered flowers that develop into peppercorns after 3 or 4 years. Click on the below titles to explore the whole range Lamb Brand has to offer.